Talking about atmosphere in video games, or any other media, is usually prefaced by two warring inferences. One: it’s tough to define exactly what atmosphere is. Atmosphere is subjective; what the creator intends often mingles with what the audience receives to create something new. Two: Atmosphere’s effects are as concrete as its definition is nebulous. Think of the macabre steampunk aesthetic of Blade Runner or the oppressive creepiness of Bioshock, and there’s definitely something more than the sum of parts at play. In this article, I’ll attempt to pinpoint what constitutes atmosphere in video games and study how Bastion, an delightful indie game released in 2011, benefits from a deliberately authored atmosphere that manifests in its narrative, gameplay, UI, difficulty, and more. To understand game atmosphere, we needn’t look beyond this insightful talk by Greg Kasavin, one of the creators of Bastion. He posits two definitions of the term, and both can stand us in good stead as we attempt to understand the elements of Bastion. Definition 1: Atmosphere is a mixture of elements that helps sustain immersion within the game world. If we think of ‘immersion’ as deep mental involvement and buy-in with what the game’s trying to convey, atmosphere is what keeps us in that state from opening menu to end credits, never breaking the spell and yanking us out into the real world. Common examples of breaking immersion would be ads, in-game micro-transactions, or a tank appearing in a Spaghetti Western. Definition 2: Atmosphere is the product of a game’s theme (the central idea behind the work) and a game’s tone (the author’s attitude towards the theme). A theme helps ground the game in some category within audience minds, and the tone helps differentiate the game within that category. For example, consider both the Metroid and the Ratchet and Clank series. Both are science fiction games where protagonists hop across planets while defeating alien foes with a bevy of weapons. But because of the vastly differing tones — Metroid is dark and edgy, Ratchet and Clank zany and comical — these are two completely different games in our minds with diametrically opposing (and equally enjoyable) atmospheres. Together, theme and tone help create a game that you may or may not play for a long time (playability depends on other factors), but you’re likely to remember it long after you’ve played it. Bastion is an action-adventure game where you play as ‘The Kid’, a white-haired, ruminative…kid, who has his world quite literally shaken by a massive explosion. He must now move through floaty, fantasy-world environments, fighting various enemies and gathering crystals to recreate the Bastion, an ancient sanctuary that can help set these problems right. It was a critical and commercial success, with most people lauding its ability to ‘stick with you after you’ve finished the game’. How did Bastion do this? Using the definitions of atmosphere discussed earlier, let’s narrow down what theme and tone Bastion went for, and how it used all its game elements in service to this theme and tone. With these terms in mind, let’s look at Bastion’s elements. In keeping with the fable aesthetic, Bastion’s visuals seem straight out of a Grimm’s fairytale book. Its levels are filled with bright, anime-inspired, hand-painted watercolor splashes that present a world at once genuine and fantastical. Since Bastion is supposed to be a story unfolding before your eyes, the environments do just that. World after world forms beneath your feet as you walk in a particular direction, adding to the dreamlike quality of the entire experience. Worlds form beneath your feet. An important thing to note here is that visuals don’t have to be realistic to sustain player immersion. 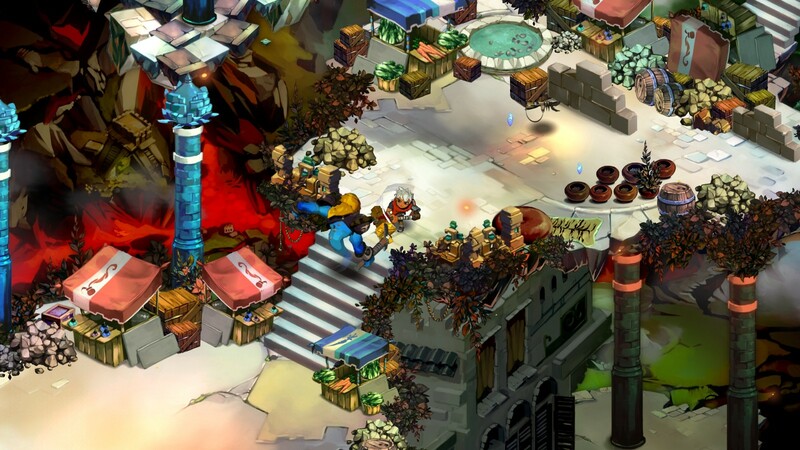 Bastion looks ethereal, but there’s a visual consistency and in-world detail that encourages players to suspend disbelief and sink their teeth into the world of Caelondia. In-game dialogue can be too pre-planned and reactive. Bastion eschews these narrative methods by employing the most time-tested way of narrating fables ever — just having someone tell the story. …and being pithy while you engage in wanton destruction. The narrator is an actual person present in the game. This form of intradiegetic narration helps player immersion because everything in the game is happening in the game. Using proactive narration instead of cutscenes allows players to be active and play the game while the narration takes place in parallel. They’re not pulled away from the world, waiting without touching the controller while exposition is thrown at them. It fits the tone of the game: you play through this fable while the narrator’s dulcet tones regale your great deeds to everyone who’s listening. The dialogue options have a lot of depth and flexibility. The narrator will comment on the actions you take, the enemies you encounter, and the environments you destroy, making the experience (at least somewhat) specific to you. Your fable. 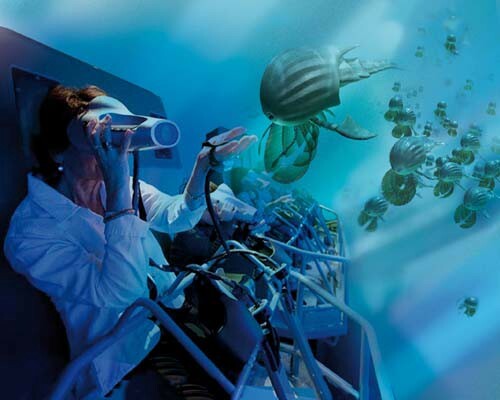 Even in the most immersive game, load screens are often the point where players come crashing out of the experience, waiting in the real world for the game world to ready itself. To its credit, Bastion does what it can here to keep you in its thrall. Since The Kid can fly (that’s how he gets around from level to level), each load screen shows him in mid-flight, staring into the blackness and wondering what horror awaits him when he lands. A nice touch to ground load screens in the game world. Bastion’s load screens show The Kid flying to the next location. The mission select screen is a similar story. Bastion could easily have had a list that you scroll through to select the next level. But instead you have a vibrant map with an airborne Kid surveying the landscape for the next land to conquer. Bastion’s charming mission select screen. Bastion has many standard action RPG tropes such as leveling up your character, choosing different weapon loadouts, and improving your weapons with modifications. The game puts in admirable effort to reference all these actions (and more) in the game world. Leveling up your character: You can build a distillery as you progress in the game, and each ‘experience level’ gained manifests as a beverage you can imbibe to attain otherworldly powers. So ‘Squirt Cider’ will increase your max health, ‘Dreadrum’ will increase your chances of critical hits, and ‘Cinderbrick Stout’ increases your defense speed. Bastion’s Distillery (the leveling up mechanism). Choosing weapons: You can carry two weapons and equip one special attack at any time. To make these choices, you need to go to the ‘Arsenal’, which you can access either at home base or within the levels if you can find them. Not only does this add to game atmosphere, but it also presents a tactical choice for the player for each level (which weapon combination to use). Bastion’s Arsenal (the weapon select screen). Modifying weapons: You might have gotten the gist by now. To modify and upgrade weapons, you need to go to the ‘Forge’ to tinker and add that extra crunch to your hammer. The unifying point is that RPG elements aren’t assigned to isolated UI screens. Instead, your actions are mirrored by actions your character takes in the game. Bastion’s Forge (the weapon modification screen). This might be my favorite bit of detail that sets Bastion apart. 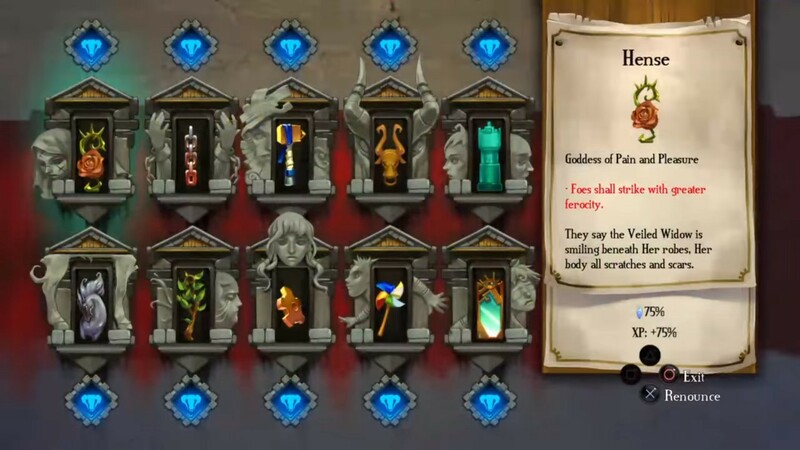 Rather than have arbitrary ‘Easy, Medium, Hard’ difficulty settings for you to choose from at the outset, Bastion has a ‘Shrine’ where you can invoke the many Gods in the game and tweak the level of difficulty to your comfort. Bastion’s Shrine (the difficulty select screen). You’re setting difficulty after having played the game for a bit. This allows you to better estimate the level of challenge needed because you know how good (or not) you are at the game. Difficulty levels are not just an out-of-game mechanic but have in-game consequence. Enemies become tougher because you ‘invoke the Gods’, not just because you selected an option. Decide on a theme and tone, and unify all game elements in service to that theme and tone. Always strive to maintain player immersion, even during stages where players might be used to dissonance (like load screens and character/weapon modifications). Don’t be afraid to break design tropes if it strengthens your game’s tone (like the proactive narration and difficulty selection). I hope this was an interesting read and made you think about what atmosphere means to you. Any other games with great atmosphere you can never forget? Let me know in the comments! If you enjoyed reading this, please click that applause button. It will help the article reach other people. I appreciate it! You can read my other stuff here. I write and I don’t know things. Focusing on game design with some soccer and general stuff thrown in. For any writing requests, get in touch!